Come to Panama for a week of sea + sun, yoga sessions, conversations on nutrition + Chinese Medicine, amazing food and the sweet sounds and smells of the jungle! Just by booking this retreat, you are funding impactful projects that are finished throughout the year and funding the local Ngobe village. 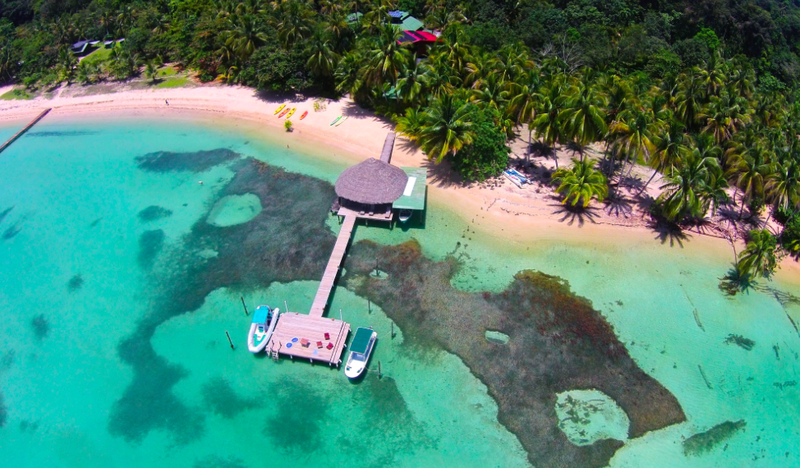 We will be nestled in the wild islands off of Bocas del Toro but the accommodations are nothing short of deluxe! Please read everything with the UPMOST attention as this retreat requires a night in Panama City on each end, depending on which country you are arriving from/flight schedules. The ENTIRE venue is ours! 6 nights, 7 days amazing accommodations. Accommodations are stand-alone, open air structures with lots of space and privacy. Excursions: half day guided snorkeling off our boat + chocolate farm tour. Round-trip transportation from Bocas town on arrival and departure days only. (NOTE: This is a smaller airport, NOT the same airport you arrived at when arriving to Panama). Coco sits near the back of our property and is our largest and most private cabin, accommodating up to four individuals. It is split up into two rooms that share one bathroom. Design and comfort are the focus of every cabin. All linens are imported – sheets are high thread count – bedspreads are fair trade and hand made in India. All beds are fitted with imported high-end, gel-top memory foam mattresses made for tropical environments. Coco is also equipped with USB charging ports and two, high powered ceiling fans. Coco has a large porch with plenty of seating. Free WiFi available in cabin. Located on the second floor of our main lodge, Rana is one of our two, elevated lodge suites. A large, open-air room accommodates two individuals or three friends. Design and comfort are the focus of every accommodation. All linens are imported – sheets are high thread count – bedspreads are fair trade and hand made in India. All beds are fitted with imported, high-end, gel-top memory foam mattresses made for tropical environments. Rana is also equipped with USB charging ports and two, high powered ceiling fans. A large, open-air shower has a great view of the jungle behind our property – you may even spot a monkey or sloth! Free WiFi available in suite. Elevated high in the canopy, Loro is our newest accommodation and is perfect for two. Loro is Spanish for parrot as staying in this accommodation is like sleeping in a chic birds nest. With amazing views of the Caribbean in the front and the jungle canopy in the back and our most unique open-air shower. Design and comfort are the focus of every cabin. All linens are imported – sheets are high thread count – bedspread is fair trade and hand made in India. Bed is fitted with an imported, high-end, gel-top memory foam mattress made for tropical environments. Loro is also equipped with USB charging ports and high powered ceiling fans. Free WiFi available in suite. * Please note this suite has one queen sized bed, and is priced to accommodate two individuals. Single room rates are available upon request. Tortuga sits directly on the beach with a large covered porch. Design and comfort are the focus of every cabin. A spacious, open-air room accommodates two individuals or three friends. and has a private shared bathroom. All linens are imported – sheets are high thread count – bedspreads are fair trade and hand made in India. All beds are fitted with imported high-end, gel-top memory foam mattresses made for tropical environments. Tortuga is also equipped with USB charging ports and two, high powered ceiling fans. Watch the waves crash on the beach and enjoy the cool ocean breezes from your porch. Free WiFi available in cabin. Delphin, not directly on the waters edge but steps from it, consists of a spacious, open-air room with space to accommodate two individuals. Design and comfort are the focus of every cabin. All linens are imported – sheets are high thread count – bedspreads are fair trade and hand made in India. All beds are fitted with imported high-end, gel-top memory foam mattresses made for tropical environments. Delphin is also equipped with USB charging ports and two, high powered ceiling fans. Delphin has a large, covered porch, where you have a view of the Caribbean. Free WiFi available in cabin. 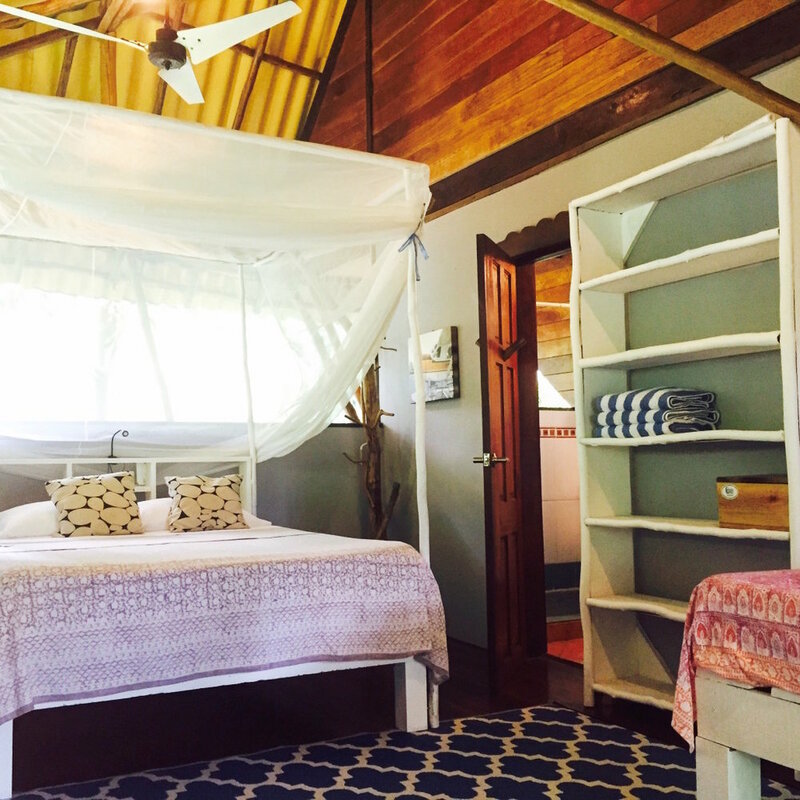 Pelicano is our most popular cabin with couples, situated directly on the beach. 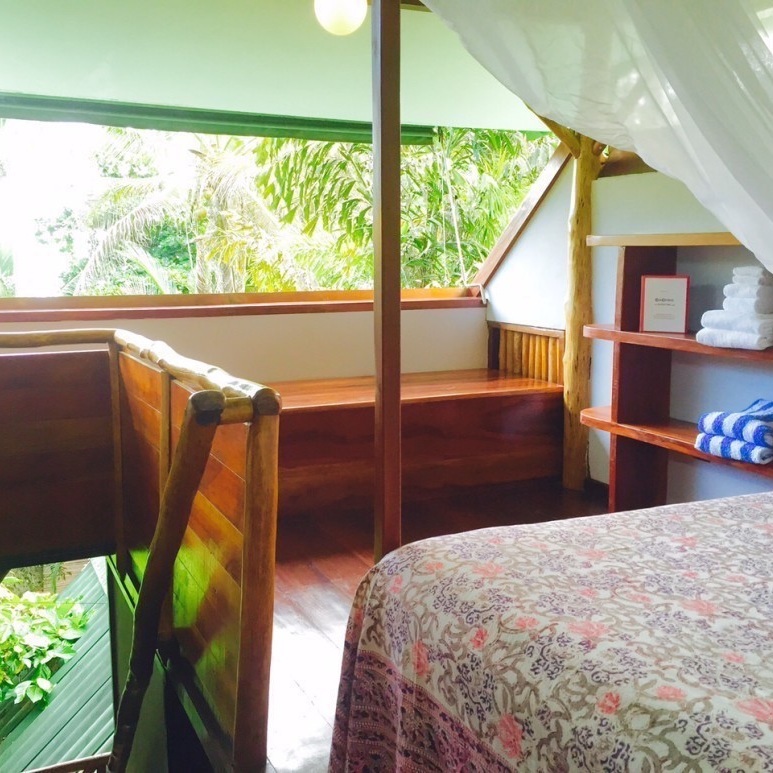 It is the smallest yet most unique of our cabins with a thatched roof and step-down bathroom. Design and comfort are the focus of every cabin. All linens are imported – sheets are high thread count – bedspreads are fair trade and hand made in India. Pelicano’s bed is fitted with an imported high-end, gel-top memory foam mattress made for tropical environments. Pelicano is also equipped with USB charging ports and a high powered ceiling fan.The wraparound porch provides a perfect spot to relax with a book while enjoying the amazing views and sounds of the sea. Free WiFi available in cabin.